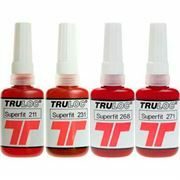 Superfit 211 Medium strength bearing grade Anaerobic self-hardening liquids that bond and seal cylindrical assemblies such as bearings and shafts. Superloc 355 High strength wicking grade High performance speciality products for all threadlocking applications. Superseal 742 Gasket Eliminator thixotropic paste Replaces solid gaskets and provides a flexible cured film. Superseal 937 Hydraulic & pneumatic sealant Locks and seals hydraulic and pneumatic threads, joints, valves, gauges, elbows, piping etc. 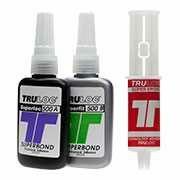 Superbond 500 Structural acrylic adhesive Two component, no mix adhesive cured by contact. Suitable for bonding metals, ceramics, glass, wood, hard plastics.